Kids fall and bump their heads. It’s part of growing up, right? However, all of us twin moms know that injuries seem to happen a bit more with our double doses of trouble…oops, I mean fun. We’ve all been there — one baby is getting into the diaper pail and as you’re pulling him away, you hear wailing across the room as their twin bonks his head on the wood floor. But when do you need to rush to the ER and when should you call your pediatrician’s advice line? 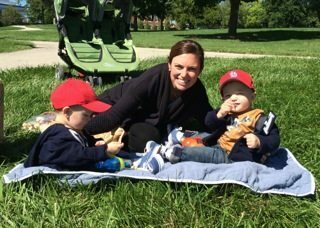 As a pediatric ER physician and mom to toddler twin boys, I hope my advice will help you get through these stressful times! Head injuries cause a lot of anxiety for parents, and rightfully so! There are some scary stories in the media about severe head injuries. However, be reassured that the vast majority of children that do not have other concerning criteria do fine and will have no long-term effects! First of all, stay calm. Often our reactions cause more tears and anxiety, so try to be the voice of reason for your little one. I would always call your pediatrician to discuss your child’s symptoms. 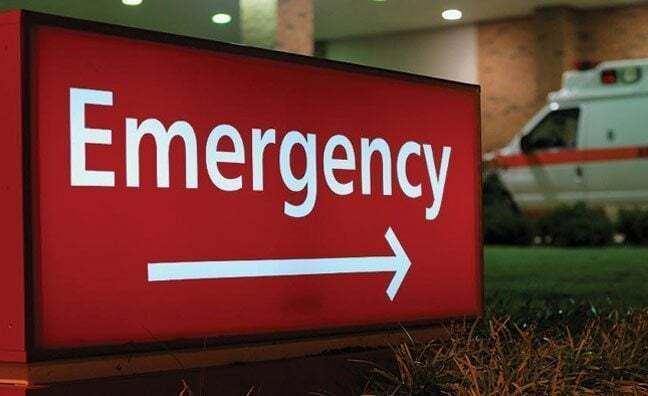 They may ask you subtle questions that would prompt a visit to the ER to be on the safe side. So what can you expect during your visit to the ER? Your child’s vital signs (heart rate, blood pressure, and respiratory rate) will be checked, as they can actually give doctors an idea about your child’s brain function! Next, you will be asked lots of questions about the injury and your child’s symptoms. Be prepared to tell your story a few times, to nurses, residents and attending physicians depending on what type of hospital you visit. A physical exam will be completed on your child, evaluating their neurological function. A pupil exam will be done as well, which is done simply by shining a light in your child’s eyes. The exam is completely painless. 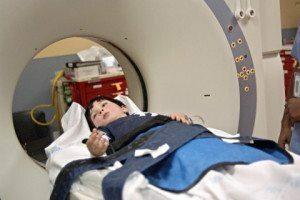 Based on your child’s history and examination, a decision will be made whether or not your child needs a CT scan of the brain. This is a radiologic test where your child lies on an examination table, which moves into a large donut-like structure for about a minute to take pictures of your child’s brain. This is also painless, but it does have some potential risks. The good news is most kids don’t need the CT and doctors are often monitored closely to be sure they aren’t “over ordering” CT scans! Believe it or not, even after training, doctors’ performance is closely monitored, and rate of ordered CT scans is one measure that is often monitored. One point that is important is to be aware of is why we care about head injuries. Parents often worry about a concussion and want a CT scan to evaluate for this. A CT scan will not evaluate for concussions, but it can see bleeding or fractures. A concussion is diagnosed based on symptoms, and your doctor will give you advice on how to treat this. We are more concerned as doctors about bleeding in the brain or fractures of the skull from head injury. Your child will typically heal just fine from a concussion. A CT scan is the only way to say 100% that your child does not have a head injury such a skull fracture (x-rays can sometimes pick these up) or head bleed. However, the vast majority of minor head injuries do not need to have a head CT. What we really care about finding on a CT scan are head bleeds, as these can cause swelling which elevates pressure in the brain and can cause subsequent brain damage. Many head bleeds (which are usually from more severe head injuries) can be treated surgically to relieve the bleeding and pressure. Skull fractures without any bleeding or compression into the brain are not so concerning actually. They will typically heal on their own and no intervention is needed. The symptoms I listed do not always mean that your child will need a head CT. After a careful examination your physician can say usually say quite confidently that your child does not have a head bleed. Many parents want the reassurance with a CT that everything is fine, but receiving a head CT is not something that should be taken lightly. If it is necessary, it is important and can be life-saving. But CT scans expose children to ionizing radiation, and especially with repeated exposure, can rarely lead to cancer further down the road. If your child is being evaluated for a head injury and the doctor recommends a CT, you can always ask if observation (usually 3-4 hours) is an option in the ER, and if your child does not develop further symptoms, he or she can usually be safely discharged home with close follow up. Personally, as a mom and a physician, I would choose this option unless my child had the concerning symptoms I listed above. Remember, kids are pretty resilient and often handle injuries better than we do as adults, but it is always best to be on the safe side and have your child evaluated by a medical professional. 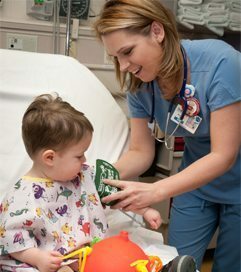 Kara Hennelly, MD is a pediatric emergency medicine physician and mom to twin 1 year old boys. Kara trained at Harvard University/Boston Children’s Hospital and now works at St Louis Children’s Hospital. Kara loves being a mom to twins more than anything in the world, and loves being able to give medical advice to moms out there now that she is a mom too!